Sooo...I haven't given anything away in a while on this blog, and seeing as I'm in the giving mood with three people just recently winning over $3,500 in software from Telerik, I think it's time to run another giveaway contest. 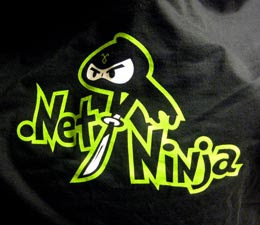 The prize for this contest is Telerik's brand new ".NET Ninja" t-shirt unveild at DevConnections. This shirt is hugely popular at the conference and it is in hot demand. Even other UI component vendors visited our booth looking to join the .NET Ninja ranks, so that should say something about how "hot" this shirt is. At tonight's DevConnections party, it looked like a Telerik company party with .NET Ninjas sporting their t-shirts everywhere. Geekettes were represented, too, but those shirts are so hot, I don't even have any to giveaway! To win one of the .NET Ninja t-shirts I'm giving away (I've got at least one, maybe two or three if I can scrounge them up), simply leave a comment on this post by midnight on Monday, April 28th telling me why you think you deserve to join the ranks of the .NET Ninja. Have you coded an application blindfolded with killer alligators snapping around you? Have you solved a production problem without ever touching a keyboard? Have you ever programmed without caffeine? If you've managed any of these ninja-like developer feats- or anything else out of the ordinary while building .NET applications- sound off in the comments for your chance to win. Standard rules apply: only one comment per person. Winners will be selected in a fair and random way. Shirts can only be shipped to the US and Canada (very sorry international readers, the shipping paperwork is just too hard to ship overseas). Comment now and check back next Tuesday to see if you've won! I am an early riser by nature, so I start coding by 7am at the office. I've never liked coffee, so I am one of those "caffeine free" kinda coders. No soda or anything. Just water to keep me going. But, my ninja story happened 7 years ago. I work in a portable building (think mobile home) that was right next to our power generator. The generator was inefficient to start with, but it was a 100+ F degree day so that poor thing didn't have a chance. Unbeknownst to anyone, the transformer had a crack in it that had been growing, and that day, it finally spilled out some of the oil inside. Which caught fire. Which heated all the oil up in the two other transformers. Which finally exploded. No really. Big BOOM! Right next to my building. Running outside I saw the ploom of black smoke rising to the sky. Then I had to run to the building next door and attempt to shut down the database server (SQL Server 6.5) before the battery backup went dark. Unfortunately, it got too dangerous to wait for the server to stop and I had to leave, which meant my database was suspect for a day and a half. Like the saying goes... you got to enter to win... (oh by the way, on one occasion I did run out of Coke and went caffiene free for at least four hours). How I did it, I dunno. I deserve the ninja shirt coz I rulez! I use telerik controls on my commodore 64 using Basic!! Thats how hard ninja I am! I code on my commodore 64 super ninjitsu style with no keyboard just mental telepathy and telerik controls. Here on TelerikBlog, .NET, same thing. Either you .NET do "yes" or .NET do "no." You .NET do "guess so" ... Miyagi say man who program .NET with chopstick accomplish anything. Code on....code off....code on....code off. I write my .NET app on a scroll in silence - cloaked in a veil of darkness. My SQL sharding quickly destroys the database bottlenecks in a flurry of sparks and restores order to the house of Starr. My sensei, 'Master Model' imparts the wisdom of the ages to my brothers 'The View', and 'The Controller'. The simple flow of life continues as it has for centuries with this ancient knowledge. Together, we are .NET Ninjas bringing honor to our family through each coming dawn, as our data flows like stars falling from my father's daikatana. And the t-shirt would make me the envy of our office. The ninja net is one not developer as me that make Real Estate, Schools, Stream video, Adv with Telerik and Sitefinity with less code! I just completed coding of a Telerik RadGrid fully client-side using jQuery and MVC with no server-side data binding! I have add/edit/update features, too, using a RadWindow and my own custom HttpHandler to generate the edit form using already existing user controls!